ShapeMaster Software, the only choice for manufacturers of aluminium composite material (ACM). ShapeMaster Software lets you create simple or complex machining and folding of aluminium composite material (ACM) that is parametrically controlled. 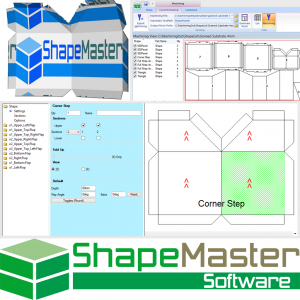 ShapeMaster Software comes with a ready to use Library that lets you parametrically modify the design of the ACM parts required. On a day to day basis you just select objects, type in a few parameters onto a simple dialog, then send todays ACM jobs to your CNC machine. With seamless integration with EzyNest or other CNC nesting packages, means you can use advanced nesting to optimize your material usage, minimizing your Aluminium Composite Material wastage.